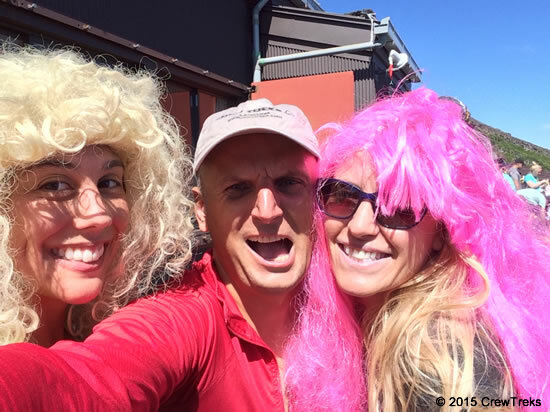 This is not the usual Crew Treks trip-it is a TRADITION! Over the past 10+ years Steven Samuel from Tokyu Excel Hotel in Narita has organized and led countless airline groups up Fuji San, the event is not just a climb up Fuji; it is a long tradition Steven started, it is a cultural journey into Japanese culture, history and customs. Marek and Steven have led this climb for several years now, and are looking forward to our 2019 adventure! Together, we have decided to join forces and continue this fantastic event. 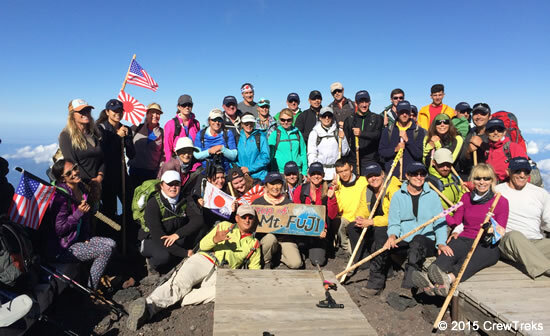 Please join us on a 2019 Mt Fuji Climb! Departure from the hotel at 2am sharp! After 3-4hrs drive, we will begin the climb up to the top and down to the lodge-we will have a toast at the summit and we will party at the lodge. The ascent time is around 5-6 hours, the descent 3-4 hours. PLEASE, train for the climb! Unfit climbers will be turned around! Mt. Fuji, is the most known mountain in Japan. The climbing season of Mt. Fuji is from July 1st to August 31st every year. This is the best season for climbing, as the weather is usually good. If furnished with a proper plan and equipment, and climbing at your own pace, both young and elder alike should have no problem in conquering this mountain. The rocky, steep terrain in some section and potential of sudden strong wind gusts are the reasons to wear proper hiking shoes which protect your ankles. -Bring proper protection against low temperature and strong winds. It can be below zero at the summit, and strong wind often makes it seem even colder. Bring rain gear as the weather condition can change very quickly on the mountain. Gloves are required both against the coldness and for hiking the steep, rocky passages. -Food/snacks; particularly on the trail where there are few mountain huts, it is important to bring enough water and trail snacks. Mountain huts offer various meals and drinks. However, that prices increase with the altitude. Also, be prepared to carry home all your garbage, as there are no garbage bins on Mount Fuji. The human body requires some time to adjust a sudden increase of altitude; otherwise there is a risk of headache, dizziness and nausea. To avoid altitude sickness, you are advised to tackle the mountain at your steady pace and make few breaks. Small bottles of oxygen, available at the 5th station and mountain huts, can be an effective tool in preventing altitude sickness. -Head light-hiking during nighttime/emergencies, a headlight is highly required in any season and essential outside of the peak seasons, when the trail is not illuminated by other hikers. Most people choose head light, as they leave both of hands free; usefull around lodge and for going to the toilet. -Yen-please bring some money for stamping of your walking stick while climbing, also for lunch on the way to the mountain and during climb. Do not carry too large a backpack as this may make your climb difficult. Pack wisely. This will make your climb a much more pleasant experience. Please have your toe nails clipped to make your descend comfortable. For those wearing contact lenses, it is best to bring a pair of goggles, as the wind can be very sandy. Also bring a pair of tee shirts, shorts or pants and socks, which can be left on the bus. This can be used in the event we get wet. PLEASE, train for this climb! Unfit climbers will be turned around! This climb is for non-working crewmembers! Family members or friends are welcomed; all must be physically fit without any medical conditions. Leave your bags with the bell desk and reserve another night for the 19/20th July 2018 in the event you have to stay another night. A lot of airline crews stay at Mystays Premier Hotel, including: AA, UA overflow, DL overflow, Air Asia, Malaysia Air, LOT Polish, NCA, JAL and more.